Just a fly by to say HAPPY BURNS NIGHT! We've just had our haggis, neeps and tatties at my parents for tea. It was yummy! Ps. Susie - I hope everything went ok for you today! I have issues with the HH on FB, I can't see new posts and my replies aren't showing up, also when I make a post it gets lost and I get a pop up that somebody reacted to it but I can't read it...does anyone else have these issues. Thought I'd sneak in a post real quick. In the middle of training. Wow almost time for a new thread. Marielle~ The last updated posts to show up on my HH Facebook page are from Monday evening too. What's up with that? Just a quick drive-by post from me this afternoon....I hope everyone is well and happy to be halfway through the work week. I guess we better prepare to start hauling out all those beautiful decorations for the next HH thread, once we hit page 200. Here's an excellent interview with David Cronenberg about Cosmopolis winning the MTV movie brawl, from the Robsessed site. David was very pleasantly surprised about the win, and especially the fact that Cosmopolis was able to take down Breaking Dawn, and even the giant, The Dark Knight. He had some nice things to say about Rob's fans in general, and raved about Rob's performance and how it will be unlike anything we've seen from Rob, up to this point. I orderd the book Cosmopolis from Amazon months ago and guess I need to get around to reading it sometime soon. I really think if it's well received by both critics and the general public, Cosmopolis will do more to solidify Rob's future as the diverse and talented actor we already know him to be, than the Twilight franchise, Water for Elephants, and even Bel Ami. More men will probably see the movie Cosmopolis than the rest of Rob's movies put together, unless they were brought/coerced/dragged to any or all of the Twilight saga films by the persuasive females in their lives. It's a public holiday in Australia today. It's Australia Day, when we celebrate Captain Arthur Phillip arriving with the First Fleet to begin European colonisation of Australia on 26th January, 1788. So Little Man gets a day off in the middle of his first school week. Not a bad thing, I think! We're going to my parents' place this afternoon, as it was my father's 70th birthday last Tuesday and it's my brother's tomorrow. So we'll take them to Baskin Robbins and give them some presents! Songbird - Yes, your daughter sounds a little more social than my son! And it's another daughter that's been going to the language class? I can imagine that speaking two different languages would make her seem a little undereducated if they were viewed separately. Sean - sorry to hear about your mum's work. It's not going to effect her, is it? Jaclyn - Happy Burns Night to you too! You eat Haggis????? Yuck! marielle - I haven't been having any of those problems, as far as I know, anyway. Tracy - yes, I saw that interview with Cronenberg. He did sound pleased, didn't he? I'm sure Rob will eventually show everyone just how good he can be. He's well on his way to doing so. Good evening, siblings. Here I am. Today was a bit of a crazy day at work. Thus, I'm just now getting online. Ginnie~ Argh! I can’t imagine how frustrating that would be to be completely without a computer and at someone else’s mercy and on their timer to get things done. I’m glad to know I caused a bit of excitement with everything else on your plate last weekend. Lynne~ So good that hubs could complete his jobs. I’ve read about the idiocy of the more movies/tv show/extension of The Saga and am seriously over a barrel about it. It just seems so completely nuts for them to even try. But, then, I’m not surprised at all either. They want to drain that cash cow until it doesn’t have the possibility of a drop left. Good for Little Man. I wouldn’t be too worried about his ability to make friends. Being in a new school, it might just take him a minute to find his sea legs, as it were. If he does get that side of himself from his mom, he’ll be just fine. Susie~ I was so glad to hear you came through with flying colors (I knew you would). Get some rest and enjoy the downtime. Marielle~ Oh, I know that they are technically the same age. But, poor Cedric… well… he’s kind of sweet and innocent and still fresh-faced. Edward might be physically 17, but he’s not psychologically or emotionally 17. He’s lived over a century. That makes it quite different for me. KSter~ Oooh enjoy having the house to yourself!! I’m sure the quiet will feel a bit strange. Oh I KNOW!!! I was actually so hoping Giamatti would do it! JH is such a fanboy, he’d have had a coronary on camera. Sean~ *hugs* I’m sorry you’ve been feeling down. I’m so glad you have someone you can talk to about it. Of course we understand. Let us know if there is anything we can do. Songbird~ The training went very well, thanks. Yes, BabySiL is BabySisterinLaw. In that lovely photo, I am on the right in the purple cardigan, Christina is in the center and Ginnie is on the left. Tracy~ I loved reading DC’s reaction to “the big win” So glad that you’re getting around to reading Cosmopolis. A bit of a warning, though. I enjoyed the book, but it isn’t for everyone. It’s definitely different. Okay, now I've got to run and check on the kiddos. Talk to you in the morning. Caryn - you always find the best pictures, girl! 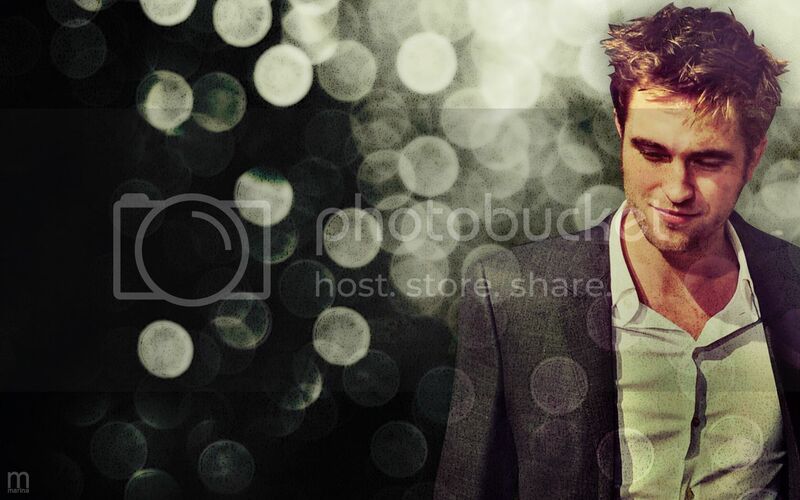 Rob in that suit! Unfortunately, our family (particularly my side) does not excel at social things. So Little Man may be just taking after his mum! I used to run away from friends to play by myself in school sometimes, something I went on to regret. I hope he doesn't follow in his mother's footsteps. WOW!! We're almost to page 200!!! We'll be redecorating before we know it! Just wanted to pop in and say hello to everyone. As promised, this has been a CRAZY busy week, and on top of it all... I have the sinus stuff again and I'm not sleeping well because of it. I am EXHAUSTED! So, I'm headed to bed tonight. I'll be back tomorrow night to catch up! SUSIE~~I'm so glad to hear you came through surgery so well today! Take it easy and rest up! We got plans to finalize for HH Con! Wooohooo! Hi Susie! Glad to hear you're doing well! Keeping you in my prayers and thoughts. We will soon need to create a new place for the Halfway House. What would you like to call it? Give me some ideas in the next few posts, and I'll make you a new thread soon.